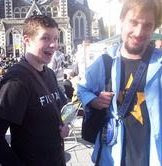 My old mate Byron is standing for the Christchurch mayoralty. The Workers Party is standing retail worker and history student Byron Clark for mayor. "Christchurch is a working class city but the council and mayor don’t represent working class interests. When was the last time one of them was seen on a picket line supporting workers? asks Mr Clark who has been active in helping unionise low-paid workers, in support work for the locked-out distribution workers last year and in campaigning against youth rates. “I also support low-paid council workers who have had pay rises in recent years that are actually below the rate of inflation and are subjected to restructuring policies which always work against them.” He also wants to address issues of local democracy, citing the closing of Edgeware pool and the recent council decision to build a road through Cashel Mall despite overwhelming opposition. At least you know that the Workers Party candidates are communists-unlike those RAM scammers. This Byron looks like a keen young bloke who believes in something other than saving his own sorry arse. What else is there up on the starting blocks- I'll give him a punt this time round. Trevor, thanks for the tipoff mate.